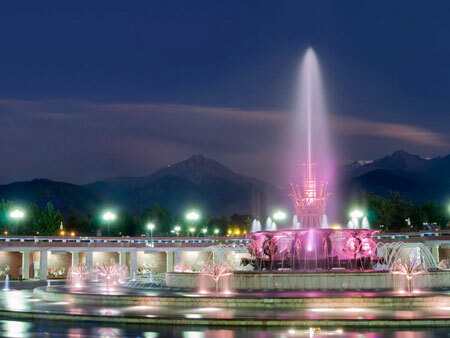 One of the bright peculiarities of Almaty is the plenty of fountains, the number of which grows from yea to year. The first fountain appeared in 1948, and today the number of them is more than 125, and it is not the limit. Today the most part of fountains is owned by private entities, and only 61 of them are administered by municipal government. All these fountains in the city perform not only the aesthetic function, but create the favorable microclimate in hot and dry summer. In whole, the entire network of fountains is the part of project of improvement of the city, the aim of which is the creation of the system of rivers, fountains and ariks (channels). Today all fountains work according to single schedule from May 25 to September 15, daily from 10 am till 2 am. 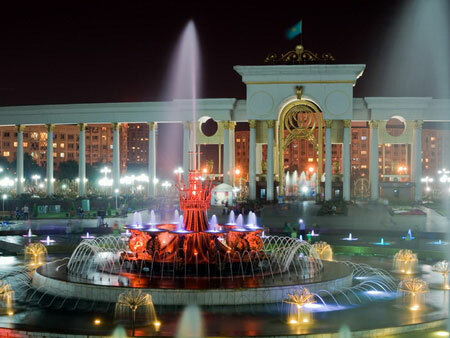 By the way, since 2005 the 25th of May is celebrated in Almaty as the Fountains Day. On this day at 9 P.M. all fountains of the city begin to work, they are lighted by color projectors, and the residents, gathering around them hail the water flows, which will create the cool and freshness the whole summer.